Back in August we featured Landscapes, the new single off of Open Windows Open Hills, the third album by Danish dreampop maestros, Tiger Baby, and now a video has finally been released. The cute catchy video, directed by Josh Kim, finds a young couple playing Space Invaders-like video games on buildings and skyscrapers! 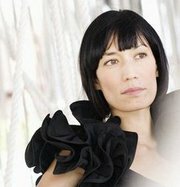 Lead singer, Pernille Pang appears only briefly on a television screen in the video (perhaps because it was shot in Korea and not native Copenhagen). Danish Tiger Baby are back with their third album, Open Windows Open Hills, that gets its release today. First single, Crystal Ball, was released earlier this year and although we are impatiently awaiting a sound stream and video for their second single, Landscapes, a chilled remix of the future single has surfaced. You are currently browsing the archives for the Tiger Baby category.